More than a couple of times in my life I’ve tried to learn the Game Of Go. This is the ancient Chinese game that is harder to solve (AI or heuristics) than Chess, or, I think, any other game. Only in 2016 was the best player properly beaten by a computer. One with the multiple brains and yadabyte memories driven by the vastness of The Google. It was a big moment for Humanity, I think. Many good games are easy to learn and hard to master. The Game of Go isn’t like this. It is really hard to learn, and very few master it. They say it takes decades to become a mere “quite good”. This, to me, has an inevitable subtracting effect on my enjoyment of the game; it is just so hard to be quite good. It would not have many of those moments of understanding a new tactic or strategy that are common in other exceptional games. The reason for it’s hardness isn’t like in some games. The problem isn’t the games complexity, that is , how many rules and parameters and interconnections are involved in it’s realisation, AKA, “playing”. Nor is it the game’s depth – that meaningful, relative measure of the structure of the hierarchy that represents the emergence of the tactics, strategy and fun experienced by the players. Rather, perhaps uniquely with the Game Of Go, it is the game’s vast possibility space that seeds the issues for me. A thing’s “possibility space” is the conceptual framework that the thing occupies. A puppy has a possibility space. So does a movie and an omelette. The concept of “Castling A King” doesn’t exist in the possibility space of Naughts And Crosses. Nor does it exist in Hopscotch. But it does exist in Chess. When you think about things in terms of their possibility space, you gain a new perspective. If CAK is in Chess and it is possible that Eastender’s might involve Chess (Eg in an episode. Which, of course, it is) then CAK is in the possibility space of Eastenders (Which, it is, isn’t it?). Possibility spaces are much easier to apprehend when they are seen as tied to shared frameworks. Think of how this influences the emergence of “plausibility” as a property of a narrative. To be meaningful possibility spaces should be internally consistent. It is for this reason that I would say we wouldn’t say that CAK was in the possibility space of Eastenders but not of a historically accurate soap opera set in The Stoneage. Lastly, possibility space isn’t just about points of property possibilities, but also emergent phenomena that the game originates. The excitement of backgammoning someone is not contained in the necessary and sufficient game description of Backgammon, but it is clearly in the possibility space of the game. It is a foundational property of the gameplay. We can deconstruct the possibilities and we can abstract the possibilities. 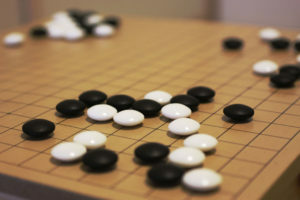 The Game Of Go is not deep in its structure. Because the board is nineteen wide, as opposed to eight in chess, there is a computational explosion in the amount of information that needs to be broken down and abstracted in order to significantly understand the game. It is a huge and wide and shallow sea of choices but from this sea emerges game phenomena that I have no idea about. I can see they are going to be there, but I cannot conceive of them. I think if you try to learn Go you will soon understand this, if you don’t already. Then the realisation is this: until you get good enough to meaningfully understand these emergent game phenomena, then Go is going to remain a relatively shallow game. Shallow tactics and strategies compared to the big picture games of the Go-masters. In my opinion Go is not very fun to learn because it is so very hard to average. There is a time/cost/fun/potential/learnability/etc equation with any game. This entry was posted in Wellbeing and tagged The Philosophy of Computer Games on February 3, 2017 by admin.